Home / Store / Collectibles / Original Art / Spider-man Doctor Octopus: Negative Exposure #1 – Cover Preliminary Art + Comic – Tony Harris art! 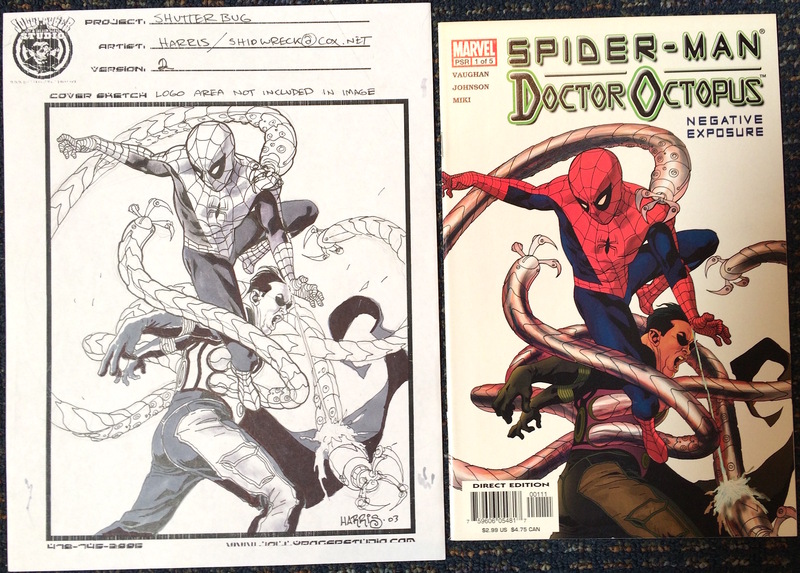 Spider-man Doctor Octopus: Negative Exposure #1 – Cover Preliminary Art + Comic – Tony Harris art! This includes BOTH the original preliminary cover art (actual size) and the comic book in NM condition. Tony Harris (born 1969) is an American comic book artist, known for his work on series such as Starman, Iron Man, and Ex Machina. He has been nominated for five Eisner Awards. Storylines surrounding the “modern-day myth” of Spider-Man are apparently endless. As Marvel and its legion of fans celebrate The Amazing Spider-Man #500, the less-hyped Doctor Octopus: Negative Exposure #1 sneaks onto the stands, giving readers a well-rounded super-hero adventure filled with action, character development, and even a few tidbits to engage the intellect. A fellow photographer for The Daily Bugle is confounded by Peter Parker’s uncanny ability to take exciting photos of Spider-Man in the heat of battle. What frustrates him even more is Parker’s nonchalant attitude about photography as an art form. Parker is perfect as the unpretentious youngster who simply takes photos in order to pay the bills, and the reader wonders by story’s end how the newly introduced photographer’s growing disdain for Parker will manifest itself. Will he sabotage Parker’s photos? Will he pull a Kenny Braverman and eventually become a super-villain? Will he team up with Doctor Octopus? Speaking of the bad (but brainy) doctor, his portrayal here is interesting. The more organic-looking octopus tentacles (as redesigned by Humberto Ramos) are a bad idea, but Doc Ock’s motivation for stealing a prized piece of Leonardo da Vinci art is a character-enlightening beauty.